A useful corrective comes in the Daily Mail today, from Christopher Booker, to "commemorate" the 40th anniversary of our entry into the European Communities. 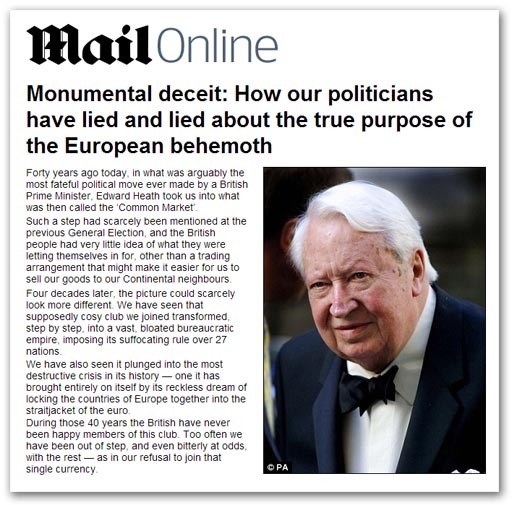 The piece serves to remind us that entry was perpetrated on the basis of structured deceit, with successive prime ministers (Macmillan and Heath) actively lying as to their broad intentions and the proposed relationship with the Six. As Booker writes: "As we see from Cabinet papers and other documents of the early Sixties, Prime Minister Harold Macmillan and his 'Europe Minister' Edward Heath were put completely in the picture about the secret 'grand plan'. But in June 1961 the Cabinet formally agreed that it must not be revealed to the British people". In Macmillan's words, to admit "the political objectives" of the Rome Treaty would raise "problems of public relations" so "considerable" that they should be kept under wraps. It was vital to emphasise only the economic advantages of British entry. Those utter fools who assert that the relationship was primarily economic (and has since gone off the rails) need to read the Cabinet Memorandum of 21 June 962, (originally referenced C. (61) 84 and now CAB/129/105), in which Macmillan set out the purpose of seeking full United Kingdom membership of the European Economic Community, as "… the only effective way of securing our political objectives in the world, and of averting the dangers of continued division in Europe". Then, in a note to his Cabinet colleagues on 10 October 1961 (Originally C.(61)162, now: CAB/129/107 - see above), Edward Heath asserted that the UK had been following closely the progress towards unity in fields other than those covered by the three communities. He conveyed to his colleagues that it was the intention of the UK to work with the Six "in a positive spirit to reinforce the unity already achieved". Heath was "convinced" that the UK and the Six "share the same essential interests", and that "the habit of working together, once formed, will mean, not a slowing down, but a continued advance and the development of closer unity". From the very start, therefore, it was evident that Heath intended to take the UK into the EEC with a view to developing further political unity. The economic issues were always camouflage, and the label "Common Market" was simply a ploy deliberately to obscure the real intent. Such a situation is irrecoverable, which means there can only be one resolution – our withdrawal from the European Union. Simply, a relationship built on lies can never prosper, and can never be repaired. We need to start again to avoid what Thatcher called "the greatest folly of the modern era". And the first step starts with the admission that the EU and its precursors were never economic alliances. The economic aspects were always a means to an end, designed to secure political unity, something which has been foisted upon us by deceit, and of which we want no part.